Yep, Sports Fans, we're almost one-sixth of the year through Year 2013. That's over 16% if you do the math. These first two months are generally always the slowest of the 12. February brought four "Idaho Visitor Events." Julie & Kenyon; Karen; Kathleen & Roger and Barb M. this week. Roger and Kathleen stopped by for about an hour last Friday. Barb visited Monday afternoon and left after lunch Tuesday. She stayed in her mini-motor home. Barb's visit was unusual. How so? In a nutshell: We'd never met before. Barb's Friends were very concerned and kept saying to her, "You mean you're going to go stay with STRANGERS?" Pretty funny. Naturally, when we started the Salmon Thang, we became partners with Lemhi Web. We advertise them for free on our website and they advertise us for free on their website. It's one of those natural partnerships that was obvious from the "git go." Barb and we have carried on a lively email correspondence since June 2012. She and her partners have carried many of our articles and we have relentlessly promoted Lemhi Web. 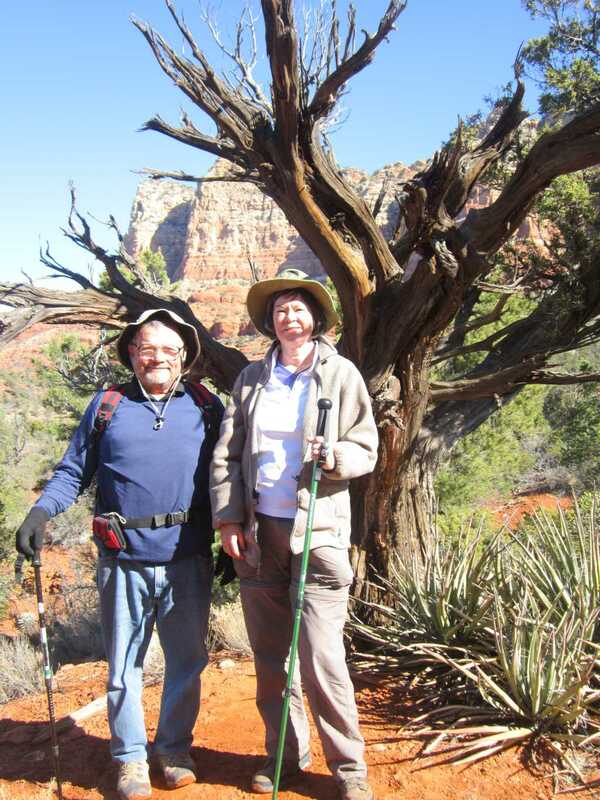 Barb's an avid day hiker and back packer. She loves and floats The Salmon River. When she happened to mention she was coming down to Arizona on a solo vacation, we immediately invited her to stop by and visit us. We three hit is off immediately and it was like we'd known Barb for many years and vice versa. We had a really great visit and look forward to seeing Barb in Salmon, Idaho this summer. Monday afternoon we walked from The Straw House up to Montezuma Well. Yesterday, we walked out to Alien Rock. It's too bad Barb couldn't stay long as we surely would have had some additional great hikes. By the way, Barb and her many hard-working Friends just started an actual print newspaper in Salmon called "The Lemhi Leader." Ironically, the weekly newspaper in the city where I was born and raised is called "The Lafayette Leader." Sometimes, there's no such thing as a stranger when it comes to being kindred spirits and so forth. She was very happy to have enjoyed a fine visit and, of course, so were we. Well, Wandering Wayne is back home in Flagstaff looking forward to his next snow shoveling episode. He graciously told his wife, Helen, that he would shovel ALL the snow in March. Chances are we will be getting very little snow in March (despite it normally being the wettest of the spring months) so Wayne's going to come out of that deal smelling like a rose. 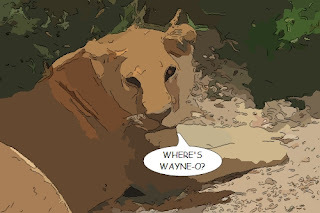 We had a lot of enjoyment poking fun with out "Where's Wayne-O?" campaign on Facebook. We even learn a new trick. We downloaded a "cartoonizer" program and had a lion ask "Where's Wayne-O?" Wayne went over-the-top with his blogging on this round-the-world trip. He did such an outstanding job and set the bar so high, it's going to be very interesting to see if he can equal or exceed his sheer production and creativity on his next round-the-world trip. 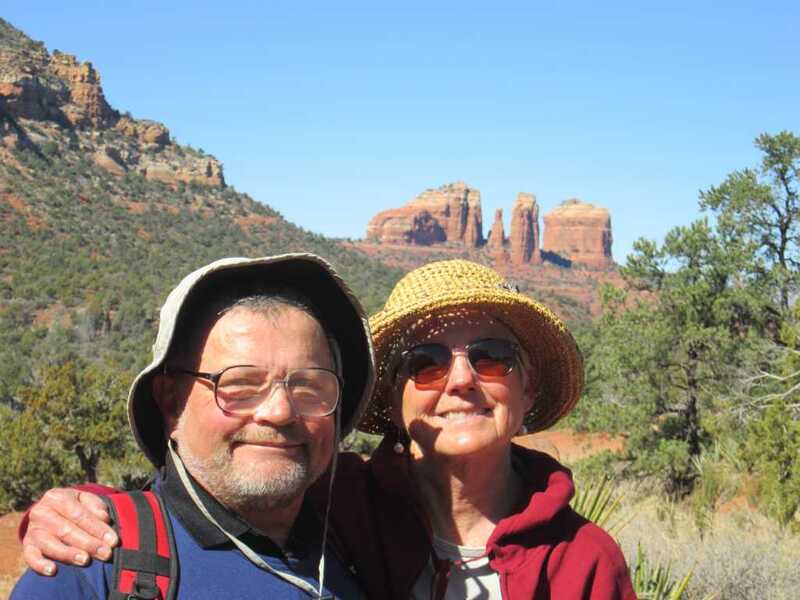 He heads out to Lake Powell soon for a houseboating trip with famed photographer Gary Ladd. Gary leads photography trips for Arizona Highways and we assume Wayne is along to regale the participants with Rock Talk. The Salmon Thang has been doing really well the last couple of days. Our normal daily visitation during the winter have been around 100 pageviews each day. We forged a new partnership with a key property in North Fork, Idaho, and as a result, visitation on Monday was 286 pageviews and then a whopping 583 pageviews yesterday. Today already, we are well over 200 page views again so life is good in that regard. Messing around with that Salmon Thang is a source of great enjoyment for me and Susun. It's a hobby we are very glad we adopted last year and it promises to continue to be a fun thing to do for many years to come. Some of you know we kind of like to "mess with people's heads" now and then. Right? Right. 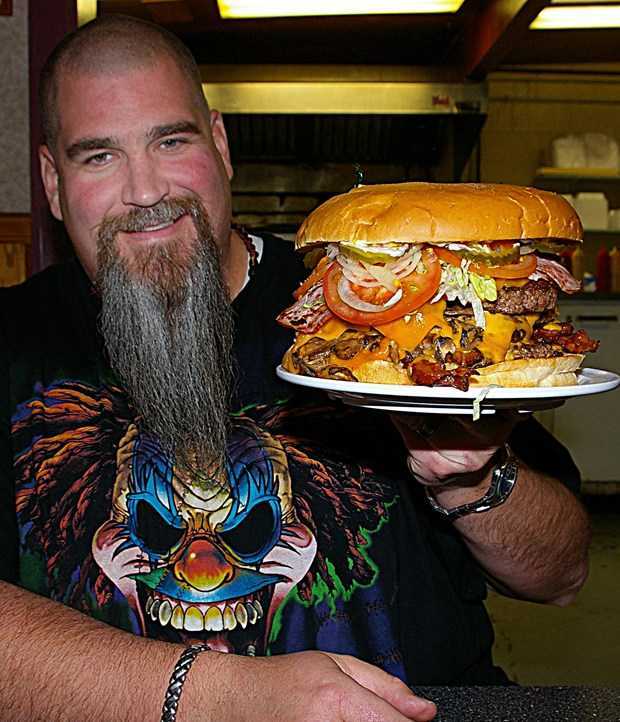 Well, not long ago, we put up a photo on Facebook of The Big Jud hamburger, a little known Idaho icon. Roger P. took the picture. Anyway, we put it up and we challenged various restaurants here in The Verde Valley to step up to the plate and see if they could muster up something similar or perhaps "worthy," you might say. 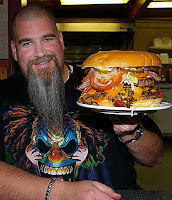 Lo and behold, one of our local fine dining establishments right here in Greater Rimrock stepped up to the plate and introduced a very worthy contender in The Hamburger Challenge. Even though it's only available on Tuesdays, we're sure proud of them to putting together a righteous hamburger. So, see, "messing with people's head" sometimes produces great outcomes. 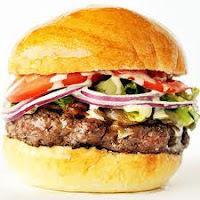 Tuesday special at Vintages...Build A Burger just $9.95 - Half Pound Burger - ground fresh @ Vintages - (chicken breast or black bean burger avail) Select your cheese, three delicious toppings (bacon, avocado, jalapeno, fried egg, etc.) with your choice of side.